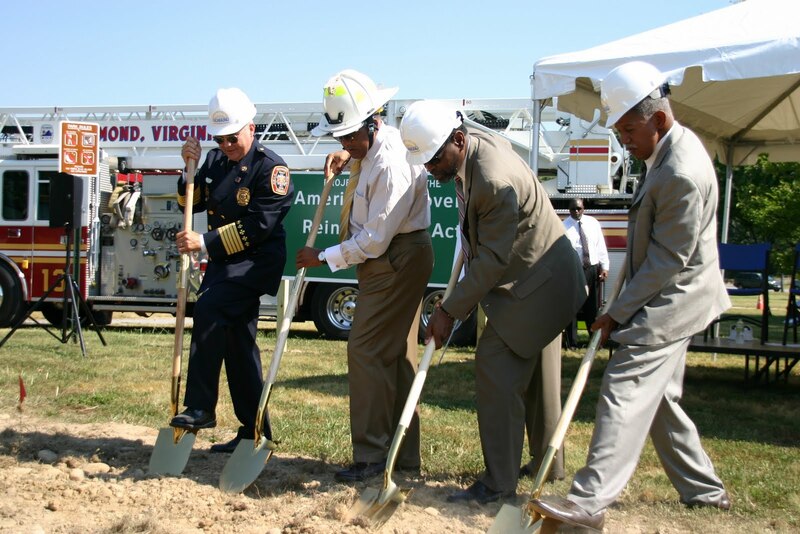 Mayor Dwight Jones joined State Senator Henry Marsh, Chief Administrative Officer Byron Marshall and Fire Chief Robert Creecy today in breaking ground on a new Fire Station No. 17 in the city’s Southside. Funding for the new fire station includes $1.4 million from the City’s Capital Improvement Plan and an additional $3.5 million from the American Recovery and Reinvestment Act. The new 3-bay, single story facility will have 11,351 sq ft of space and include bunk rooms with shower and toilet facilities; dayroom, kitchen and dining rooms; offices and bunks for the battalion chief and station officer; watch room; exercise room; study room; lockers for personal items as well as separate lockers for turn out gear; and a cascade (breathing equipment) unit. The new fire station is slated for LEED Silver certification, as it will reduce water use by 35%; improve energy efficiency by 24%; 75% construction waste recycled; contain low-emitting building materials; use controlled lighting and thermal comfort systems; water efficient landscaping and building recycling collection and storage areas. As the construction of the new fire facility occurs in a small portion of Canoe Run Park, several park enhancements are included in the overall construction project. The enhancements include moving and improving the running trail, installation of trail lights, and moving several young trees from the Semmes Road area to other parts of Canoe Run Park. The new Fire Station No. 17, located in Canoe Run Park at 2211 Semmes Avenue, will replace the existing Fire Station No. 17 that is located on Bainbridge Street. The old fire station was built in 1917 for horse drawn equipment, and the one-story brick frame building has been in continuous use for more than 94 years. Click here to view the groundbreaking ceremony of Fire Station No. 17.